Buy Weleda Rhus Tox.30c - 125 tablets Rhus Toxicodendron Quercifolium in the UK from our online shop or directly from our independent Scottish store. Rhus Tox 30C is ideal for active or acute over the counter (OTC) use. 30C remedies should be taken as a short course only, unless prescribed by a practitioner. As official Weleda stockist, we sell genuine Homeopathy directly from our shop in Scotland and online throughout the UK. Where can you buy real Rhus Tox. 30c safely online? If you are wondering where you can buy Weleda Rhus Tox.30c - 125 tablets Rhus Toxicodendron Quercifolium safely online in the UK, then shop with us. We are an actual health foods shop; with real people selling real foods and products. Our award-winning independent shop is located in Stirling, Scotland since 1976. You can buy our Natural, cruelty free skincare. Homeopathic remedies and other genuine Homeopathy in store or safely place an order with us online or over the phone. Rhus Tox. 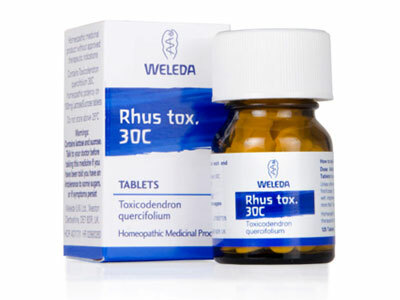 30c - Weleda Rhus Tox.30c - 125 tablets Rhus Toxicodendron Quercifolium in Homeopathy and Homeopathy & Tissue Salts.